Being a Ram, you have the honour of being the first sign of the Zodiac. Needless to say, you possess strong and powerful characteristics. You have a strong sense of purpose and march forward towards your goals with great zeal. Your reserves of energy are practically unlimited and it is not easy to make your tired. Courage is your most outstanding quality, so you are happy to lead from the front, while people in your circle are more than content to follow in your footsteps. You are also frank and straightforward, and prefer to face problems head-on, instead of trying to beat around the bush. Since you are always eager for action, you may sometimes tend to be impulsive, and vulnerable to being misled. Astrology deals with ten planets, namely the Sun, the Moon (the two luminaries are considered planets in astrology), Mercury, Venus, Mars, Jupiter, Saturn, Uranus, Neptune and Pluto. Minor celestial bodies, such as the Dark Moon, asteroids and the nodal axis, are also taken into account. Each planet has its precise function in the natal chart, and represents a specific energy. The planet’s action is influenced by the sign it tenants. It plays out primarily in the area of life indicated by the house where it is posited. Mars (Ares in Greek mythology) is the God of war. He was regarded as "the father of the Romans". Many soldiers worshiped Mars and prayed to him for a successful battle. He was celebrated in festivals in both March (the month named after him) and October. Mars is the symbol of masculine energy, and fits the sign of Aries very appropriately. Sometimes women in this sign can come off very masculine either in looks, in personality, or in both. This sign emits a lot of Cardinal and positive energy. They make great leaders that drive the ones in their control to success. Mars ruled Aries is cardinal fire. Any planet in this sign becomes a bullet—red-hot, impulsive, and ready to go. Aries planets are not known for their patience. In fact, they hare waiting more than anything. There are no obstacles in the mind of an Aries planet. There’s only where they are and where they want to be, and the shortest distance between those two points is a straight line. Aries planets prefer cutting to the chase over any other tactic. They boldly charge in where few would dare to go. They are brave, courageous, impetuous, and direct. Your Aries planet will always be exactly what it seems to be. This is the first sign, so Aries planets are often very good at initiating projects or starting things up. They aren’t as eager to finish, though. That’s more of a fixed quality, so projects often are left undone. 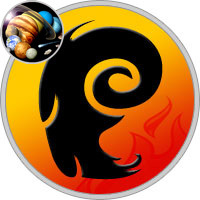 Aries planets need a physical outlet for their considerable Mars-powered energy—otherwise their need for action can turn to stress. Exercise, hard work, and competition are excellent outlets for the active energy of Aries and Mars.